You'll be £6.00 closer to your next £10.00 credit when you purchase How to Grow and Eat Your Own Super Foods. What's this? In an age of clean eating and fad diets, the term super food has become synonymous with inflated prices and overstated claims about the disease-fighting, anti-aging, life-enhancing powers of certain foods. Sales of fruits and vegetables like kale, beetroot and blueberries have rocketed, but why spend money on products that have travelled miles around the country or even the globe only to sit in a supermarket wrapped in plastic for days, when you could grow your own? This lively, engaging book weeds out the hype and unearths the secrets of what makes a food a super food. Discover a wide array of fruits and vegetables all with their own super qualities, and learn how to sow and plant them yourself, free from chemicals and full of goodness. In the comprehensive directory of crops you'll find information about the nutritional benefits of an A to Z of fruits and vegetables, followed by practical advice for planting and growing, plus mouthwatering recipes for making the most of your harvest. Experience the delight of following your food's journey from seed to plate, and the gratification of picking and eating your own produce. Indulge your taste buds with tasty, nutritious meals, where the key is pleasure not avoidance. It's time to take control of what you eat and grow your way to better health. It gave me all the information I needed to get the best out of my crops, especially when trying to be as organic as possible! An informative book which I'm sure will provide lots of inspiration to many new gardeners. As an avid food gardener, I was most glad to receive a copy of this useful book. Nurturing your own food from a tiny seed to a strong robust plant is satisfying on many levels, none perhaps more so than eating your own organically-grown produce. 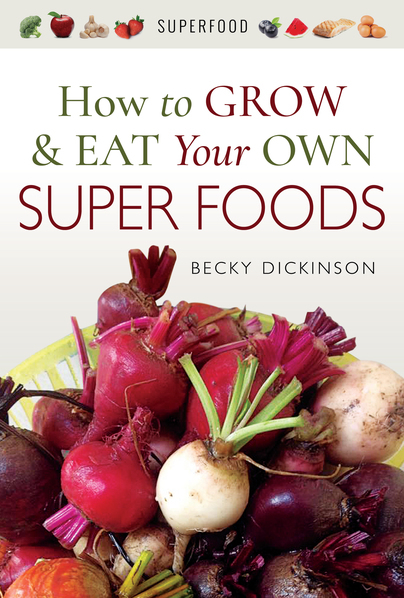 This book explains in easy to understand language everything needed to grow healthy superfoods on your own! This is a very useful and informative manual on the health properties of certain vegetables etc., that you can grow very easily at home. The directions are easy and straightforward to follow. As well as the satisfaction of producing your own food, home grown is much better for you as once the veg., etc. has been picked the precious nutrients and vitamins are very soon lost and sitting on a shelf in a greengrocers or supermarket is not ideal really. Plus they taste much better when used straight from the garden. Another bonus is that if you have children, getting them interested and involved teaches them a lot about where food comes from, what it looks like and how tasty vegetables can be - no bad thing! A very straight forward easy to read and follow guide to fruit and veg. There is no jargon and the book is very easy to understand. I am a relative beginner and found this easy to follow with lots of hints and tips to get the most of of your growing experience. If you need some help and motivation this book is brilliant. Full of loads of useful information. Very nice book with a lot of tips to help me start my garden this year. I also love the few recipes sprinkled throughout the book. I am extremely impressed with the devotion and time that Becky Dickinson put into this book. This is the type of book I could have used two years ago when I started my garden. I will be using her knowledge that she put into this book in this summers garden. I love how she went into detail on the importance of healthy soil and composting and how that is the key factor in a garden. Also enjoyed her knowledge about how different and specific fruits and vegetables need certain things to grow better. Three key factors in soil are Nitrogen, Phosphorus and Potassium. She outlines the importance of crop rotation and companion planting and how different soil's (lowing, silty sandy, clay) work better on growing certain vegetables and or fruits. This book is miraculous and is a must for anyone who has a garden or is thinking about starting a garden. Brilliant!! Becky Dickinson is a freelance journalist who writes for national newspapers and magazines and runs the website allotmentmum.co.uk. She has also written a number of children's books for schools. She is passionate about the benefits of gardening, both for physical health and mental wellbeing, and is dedicated to encouraging people of all ages to grow some of their own food. She lives in Devon with her partner and three children, and an army of slugs she's determined to defeat.